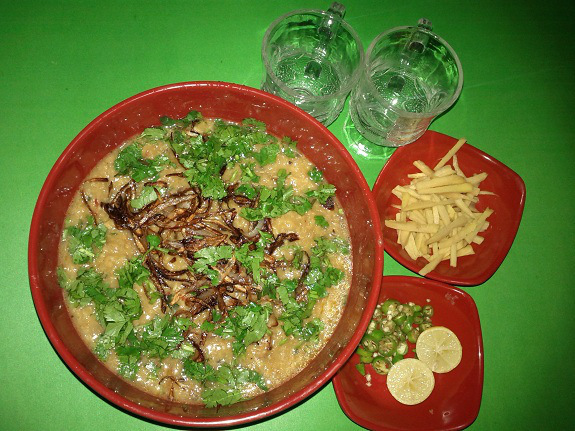 Haleem is a very special and tempting Asian cuisine, with a delicious combination of lentils and spices with meat. It is always cooked in large quantity like sarso saag. It is served with chapattis, with naan and parathas it makes a special lunch. In a large cooking pan, add plenty of water and cook all given lentils, porridge and rice at low-medium flame for about 1 hour till they all very very tender and incorporated. Keep it aside. Fry onion in half cup oil, when onion is golden color, add garlic and fry til its fragrant and golden. Then add chicken in it with tomatoes and cook over medium flame till chicken get tender and cooked. Add ginger 4 TBS, salt, red peppers, green chilies and fry chicken with ginger for about 20 minutes and till all water dries. Let all this cool and then take out chicken from the gravy and remove the chicken bones from chicken meat. Discard bones and add chicken meat back to the gravy. Now add 2 TBS ginger crushed and all the cooked lentils -rice porridge mixture to the chicken gravy and cook over medium flame, stirring continuously, till its all mixed, incorporated and desired thickness is attained and no meat chunks are there. (Use cake blender if needed to make the meat well mixed and incorporated). At the end add 3-4 TBS chat masala and mix well. Serve hot with the serving ingredients.